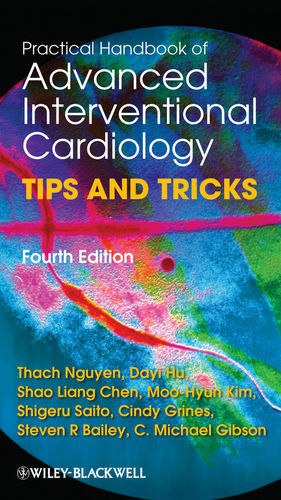 Written and edited by today's most-recognized inteventional cardiology thought leaders, this popular guide focuses on key procedures and techniques. Each strategic or tactical move is graded by complexity level and described in a simple, step-by-step approach that includes guidance on how to overcome practical difficulties and navigate particularly challenging clinical scenarios and complications. Thach N Nguyen, MD, FACC, FACP, FSCAI Director of Cardiology, Community Health System, St Mary Medical Center, Hobart, IN, USA. Since 1992, he actively participated in the organization of the Great Wall International Congress of Cardiology, the largest cardiology educational meeting for China. His major publications include Management of Complex Cardiovascular Problems (2nd Edition in English, Spanish and Vietnamese 2002). Practical Handbook of Advanced Interventional Cardiology (2nd Edition Blackwell, Oxford, UK, 2003; 3rd Edition, Blackwell, Oxford, UK, 2007). He has an academic appointment at Indiana University School of Medicine, honorary professorship of medicine at the Capital University of Medical Sciences and the Institute of Geriatric Cardiology of The Central People Liberation Army Hospital 301, Beijing, China. He is editorial consultant for the Journal of Interventional Cardiology and was co-editor of the Journal of Geriatric Cardiology.